Megafauna were part of a cohort of "giant" animals, species of large animals, reptiles, birds and mammals that went extinct during the Pleistocene as our rellies, the homeo sapien sapiens, were spreading out of Africa and southern Asia to populate the globe. Our rise marked the demise of many of the Earth's most interesting beasts. 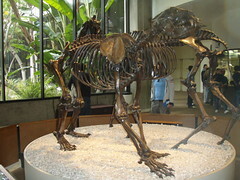 The term, 'megafauna' refers only to those species larger than forty-five kilograms. Many smaller animals who lived along side these giants also disappeared during the Pleistocene, but it is the largest of the lot who get the title and our attention. 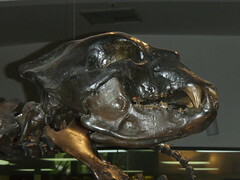 While the fossil record shows that most of the megafauna from North and South America, northern Eurasia and Australia went extinct during this time, it is not the case for all large beasts. Blue Whales, hippopotamus and elephants are notable exceptions, surviving into modern times. The court is still out, but most scientists argue the rise of our ancestors played a role. Larger scale hunting, climate change, and spreading disease have all been fingered as the culprit for the loss, but, like most ancient mysteries, evidence is mixed and the truth is complicated. My vote is that their ultimate demise is a combination of the three.